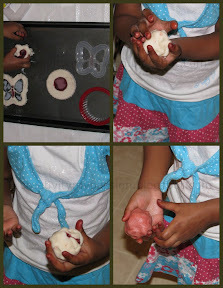 We made homemade Play dough inspired by the play dough recipes around the blogger world. I wanted Cj to enjoy and experiment the color change so first we made white play dough. We mixed different favors of unsweetened Kool-aid to make colored ones. Homemade play-doh with added advantages like lighter shades, kneading fun and the kids love to see the change in colors. Bring 2 cups of water to a boil and pour into the bowl of dry ingredients. Mix well and add the oil while mixing. We bought out our cookie cutters and stencils. Cj loves playing with the cookie cutters. We used Stencils and kool-aid to decorate the play cookies. After the cookie cutter play, I asked Cj to take a cookie and knead it. She knead the one with cherry flavor kool-aid(red) and she was excited to see the color change. Sealed/zipped and packed for future play! Stay tuned for some more Kool-Aid Play! Ooh they look good enough to eat!! And homemade playdough is simply the best. Bet the kool aid makes it smell lovely! Thank you for joining kids get crafty again! Yeah Maggy, our house was smelling like cherry and Oranges!